Sound On Sound, 5 stars! say that ERA is the best sounding, most cinematic library of its kind I have heard. An instant addition to my palette, Bravo." Video Game composer of Rayman Origins, The Adventures of Tintin: The Shadow of the Unicorn among others. "As a composer I worked last year on Rayman Origin´s, a UbiSoft Video Game. I needed to find Middle-ages Instruments to animate the World of princesses and dragons in our next project, Rayman Legend ! I found all I needed in ERA. I was really thankful to Eduardo to have succeded in making such wonderful program allowing the best playability possible. Thank you Eduardo for your wonderful work." "Era has been loaded into my template, and has already proven really useful. Eduardo Tarilonte´s attention to detail is always top drawer." "Eduardo Tarilontes ERA Medieval Legends war mir bei der Komposition des Scores zum „Vermächtnis der Wanderhure“ von unschätzbarem Wert. Die beeindruckende Klangqualität und die intuitive Spielbarkeit dieser Auswahl mittelalterlicher Instrumente sucht Ihresgleichen." 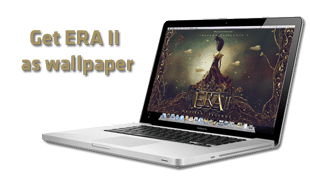 ERA II takes you on a distant journey into the medieval world, deeper than ever. Eduardo Tarilonte, creator of award-winning libraries such as Forest Kingdom, Desert Winds, Epic World and Shevannai, presents the considerably expanded version of the first edition of ERA Medieval Legends. ERA II offers an even more comprehensive selection of historic instruments. This library contains the perfect instruments for film- and television soundtracks with historical background, fantasy-games as well as folk-music, medieval-rock and related compositions. For ERA II, Eduardo Tarilonte created 25 new instruments, resulting in a total of over 70 instruments, all recorded in highest detail and quality. In addition, there is a huge amount of soundscapes available - all ready to use within the advanced Engine-Player and its generously expanded and specifically optimised user interface. Recordings for ERA II took place in several selected spanish studios, such as Madrid's Infinity Studios as well as Eldana Studios in Dueñas, just to name a few. Also, numerous talented musicians contributed their skills to the project, like Rinaldo Valldeperas (crumhorns, shawms, renaissance soprano recorder), Efren López (Gittern, Bass Citole, Medieval Psaltery, Medieval Lute), Cecilia Nocilli, Lorena Porres and many others. All instruments and voices were recorded using a Neumann U87 microphone being accompanied by selected high-quality preamps from manufacturers such as Avalon and Neve. The instruments were intentionally captured with close mic techniques avoiding unwanted room information to give users full control over the subsequent sound shaping process and added effects. ERA II pursues the goal of capturing the musical atmosphere and sound aesthetics of the medieval, porting these old times into the computer-based production environment. The carefully programmed user interface of the Engine-Player makes this library easy to use, allowing the sounds of ERA II to inspire and unfold the musician's full creativity. ERA II is just like an exciting fantasy-novel, taking musicians and composers on a journey into dark and long forgotten times. ERA II is well suited for different styles and genres ranging from medieval scores with authentically sounding instruments to fantasy-music, soundtracks and new-age-spheres. The sounds of ERA II are absolutely unique and cannot be found in any other library. It holds an overwhelming selection of instruments, sounds and soundscapes that provide musicians with a complete sonic compendium, leaving no sound to be desired. The instruments in ERA II use extensive multisampling, dynamic layering, diverse articulations, round-robin and true-legato-samples. The library contains 25 gigabytes of sample data including all instruments and sounds of volume one. I am trying to purchase all the products of Eduardo Tarilonte. Excellent Product, I would recommend it to everyone! !